Seyðisfjörður is a colorful and lively fishing village in the East of Iceland. 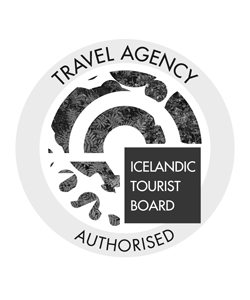 It is famous for the rainbow brick road, light blue church, the amazing museums, delicious restaurants and the Norröna Ferry which takes travelers from Scandinavia to Iceland. Find out all about it! How to get to Seyðisfjörður? What to do at Seyðisfjörður? Where to eat at Seyðisfjörður? 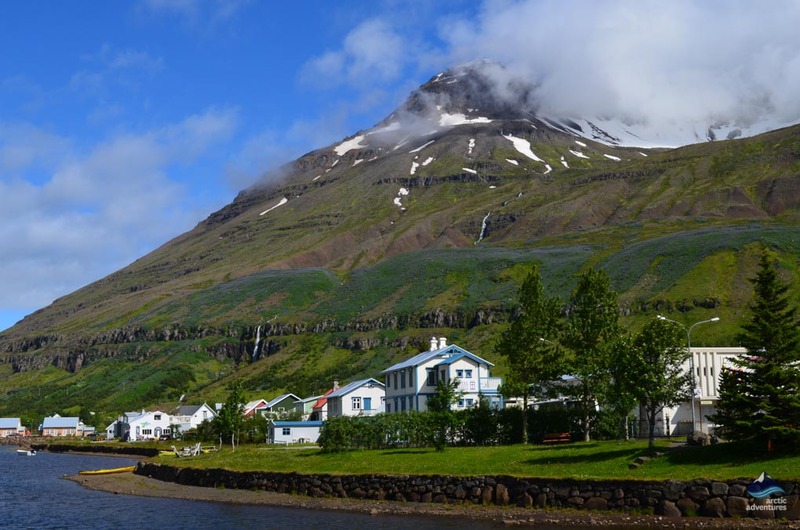 Where to Stay at Siglufjordur? Seyðisfjörður is a beautiful charming fishing village in the East of Iceland located about 30 minutes from Egilsstaðir. 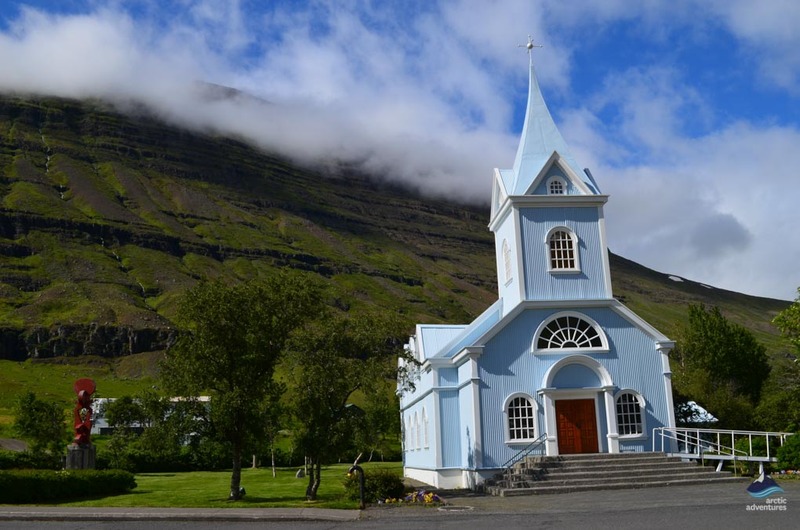 The town is recognized widely for its beautiful light blue church and the rainbow painted path leading up to it. There are definitely numerous photo opportunities in the town but this one is a must. 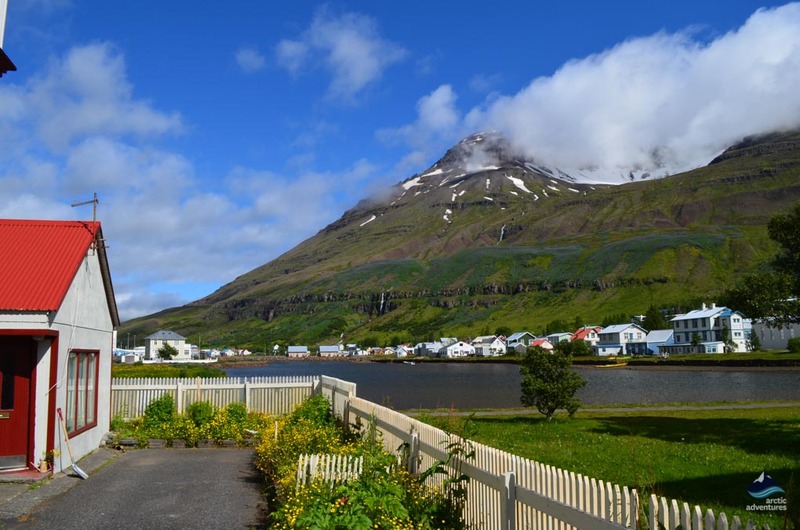 Seyðisfjörður is home to some of the best museums in East Iceland which are definitely worth checking out when visiting. The restaurant scene is surprisingly great due to the smallness of the town but this is the place to try authentic local cuisines such as reindeer meat or seafood. 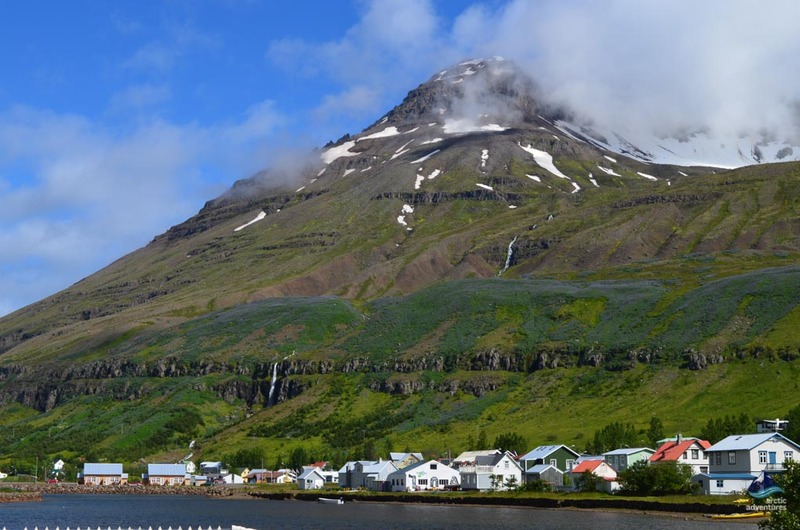 Seyðisfjörður is the port in Iceland for MS Norröna – Smyril Line the ferry that takes you between the Scandinavian countries and opens up the possibility to take your own car or camper to explore Iceland! In World War II an oil tank sank in the fjord and it is still there. The tank was called El Grillo and today you can try a locally brewed beer with the same name! 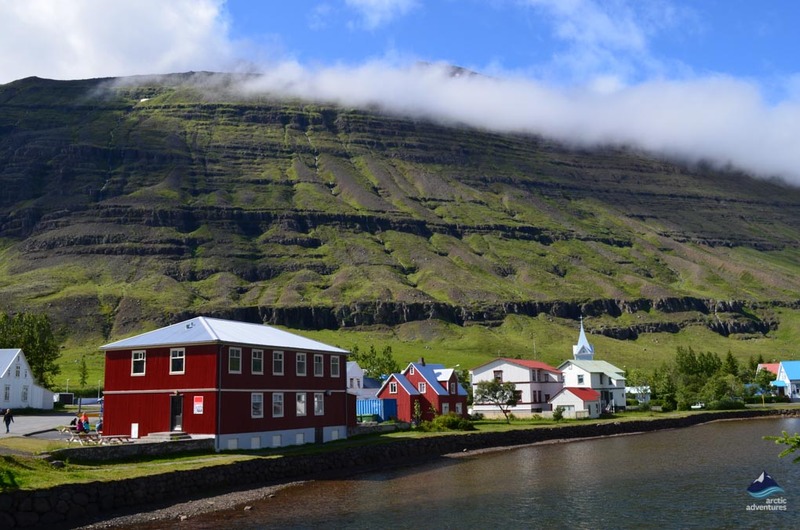 Seydisfjordur is a fishing village located at the bottom of a fjord with the same name in the Eastfjords in Iceland. It is about 27 kilometers (16,7 mi) from Egilsstaðir and 274 kilometers (170 mi) from Akureyri which are the closest larger towns. Driving from Reykjavík to Seyðisfjörður will take about 8-9 hours and is not recommended to do in one day. 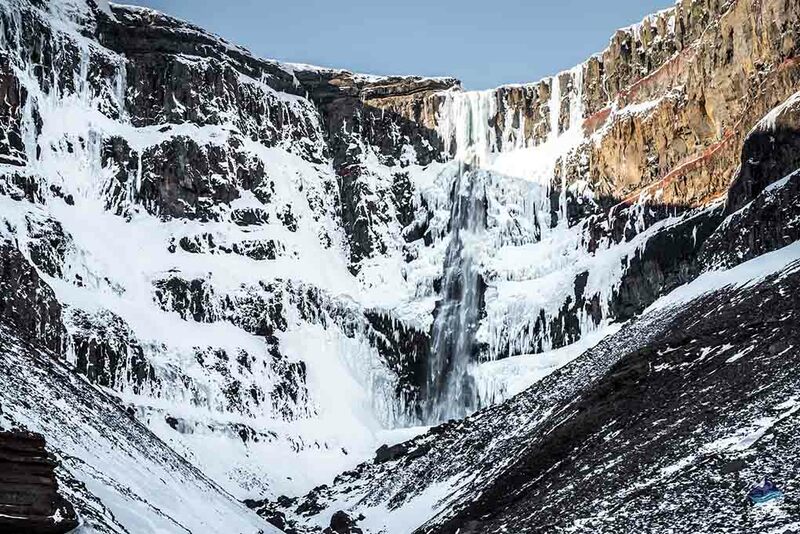 For the majority of the trip, you will be driving along the Ring Road and there is simply far too much to see. The fastest way to drive is clockwise and will take you North through Borgarfjörður, Skagafjörður, Akureyri and the beautiful Mývatn area. 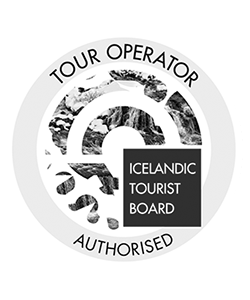 But, you can also go counterclockwise through Selfoss, Hvolsvöllur and Höfn and past the waterfalls Seljalandsfoss and Skógafoss and even the stunning Jökulsárlón Glacier Lagoon. Public Bus – The public bus will take some time but the drive is beautiful and well worth the trip. First, you will need to take Bus 57 out from Reykjavík (bus stop Mjódd). Leaving at 9 am and arriving at Akureyri at 3:30 pm. From Akureyri, you will need to take Bus 56 at 3:50 pm to Egilsstaðir. There you will need to stay the night and catch Bus E3 from Egilsstaðir to Seyðisfjörður either in the morning or the afternoon. Flying – the closest airport to Seydisfjordur is at Egilsstaðir. You will need to catch a flight at Reykjavik’s domestic airport and you have the options of three different flights a day. In the morning, afternoon and in the evening. After landing at Egilsstaðir you can either catch a public bus or get a rental car from Egilsstadir to Seydisfjordur. 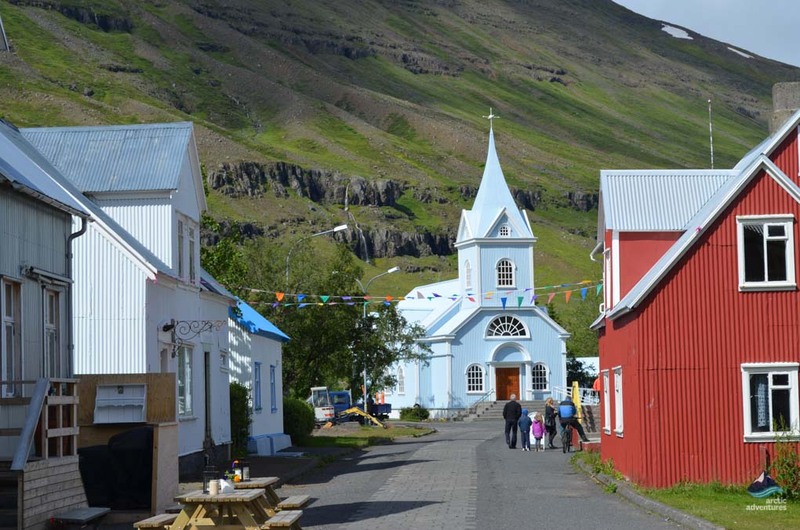 Take a photo at the rainbow street and Blue Church – this shot has become somewhat of a signature photo of Seydisfjordur. The Eiffel Tower of Seyðis! Taste the El Grillo Local Beer – the must try when in the area, a light lager that goes well with a burger. Visit the Tvísöngur Song Sculpture – Seyðisfjörður is somewhat of a arts center so you might not be too surprised to hear that they have huge sculpted caves made for singing. A fun visit at the side of the fjord! Take a dip in the local swimming pool – no matter the size, any village in Iceland will have a swimming pool but the one at Seyðisfjörður is especially nice! Explore the Fjarðarsel Power Plant Museum – this power plant is one of the oldest in Iceland dating back to 1913. The opening of the Fjarðarsel power plant marked a big shift for the community and was an important step for the community. A great step into history! Join the LungA Art Festival – an annual festival held during mid-July with musical acts, workshops and exhibitions. Definitely worth the visit! Visit Skaftfell Center for Visual Art – a lovely café surrounded by contemporary art, a fantastic and tranquil place. Buy a souvenir at Gullabúið – this shop is a surprise find in a tiny village like Seyðisfjörður but a delightful one and well worth the stop. Take a hike – there are so many beautiful hiking trails around the village and mountains waterfalls to be found. Strap your boots on and enjoy the Eastern region in Iceland. Visit the Technical Museum of East Iceland – the museum was established in 1984 and hosts very interesting exhibitions. Kaffi Lára / El Grillo Bar – excellent food and a good garden to sit in outside if the weather allows. Burgers, chicken, seafood, steaks, cakes, and so many other options in a charming setting. Bistro Skaftfell – delicious pizzas, fish & chips, fresh fish from the fjord and great deserts. The bar is well packed and the whole ambiance lovely. 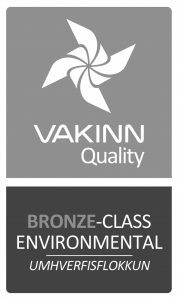 Hotel Aldan / Nordic Restaurant – they do everything from casual to fine dining. A great place to try the local cuisine, anything from reindeer to lamb tartare. 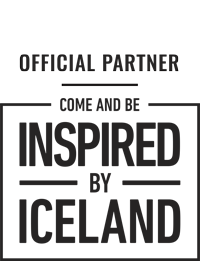 Norð Austur / Sushi Bar – as the name gives away this place is all about sushi and delicious seafood. 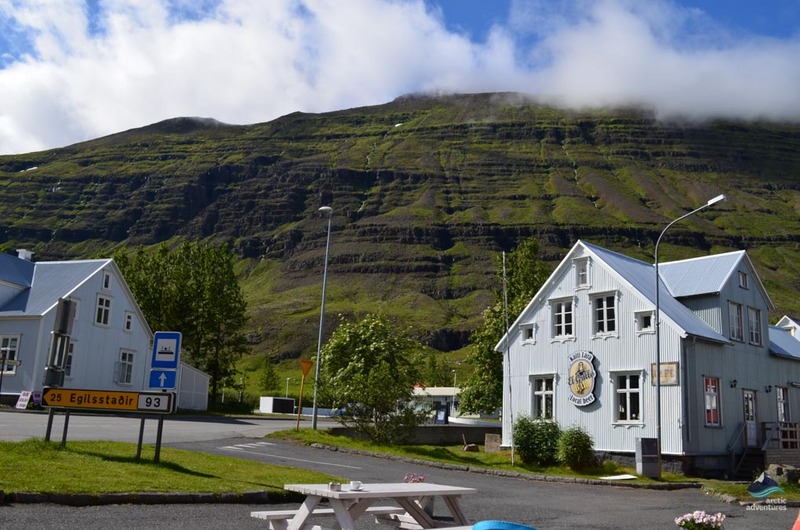 An excellent choice for dining at Seydisfjordur. Located at Hotel Aldan. Price is 1600 ISK per adult (15+) per night. Open from the 1st of May to the 30th of September. 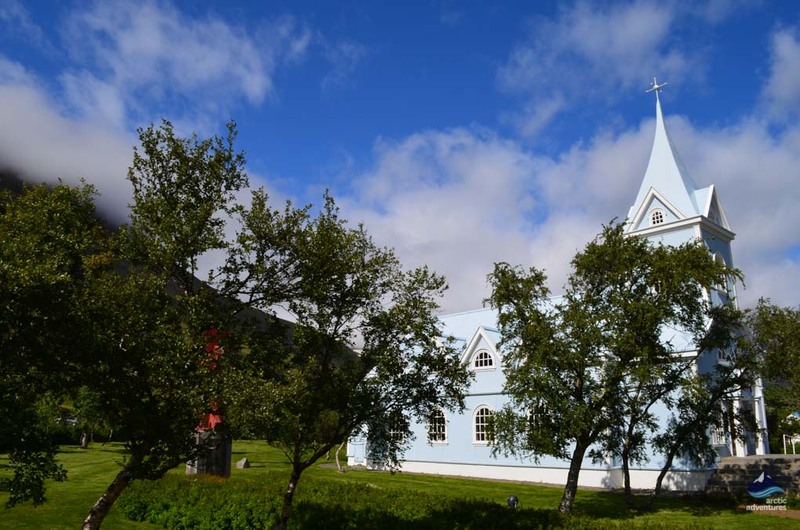 Visiting Seyðisfjörður in winter can be a bit tricky due to weather and road conditions but if you are able to visit the village is excellent for a winter retreat or a getaway. The fjord often bathes in Northern Lights and there is a skiing area for the sporty travels to enjoy. 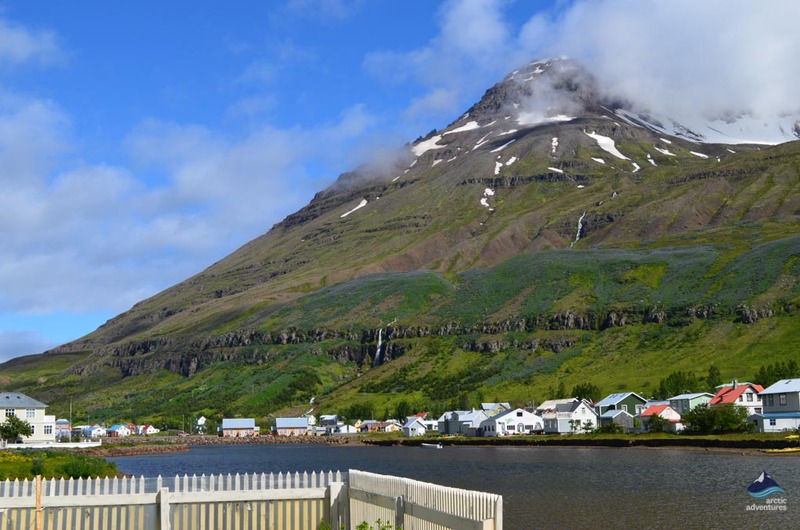 The Secret Life of Walter Mitty (2013) the famous skateboarding scene when Ben Stiller goes down beautiful mountain hills is filmed right above Seyðisfjörður. You will also see the colorful wooden houses and the marina in the film. Trapped / Ófærð (2015) an Icelandic crime series that is now available on Amazon Prime and was shown on BBC4. An all Icelandic cast with star director Baltasar Kormákur. Partly filmed in Seyðisfjörður but the show takes place in Siglufjordur.